Chee Wang Ng’s piece, “108 Rice Bowls” is a site-specific iteration of a previous installation. 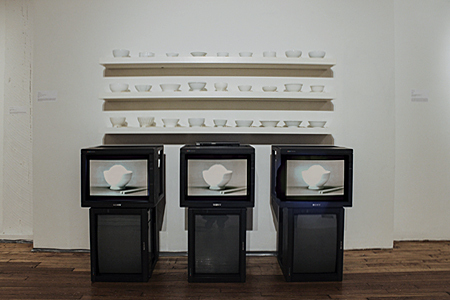 Shelves lined with empty bowls, all seemingly “asian” in style, are mounted above 4 televisions. A soft, harmonious ring accompanies images the bowls, flashing one-at-a-time on the TV screens. A text overlay calls out where the bowls were each made: Germany, Korea, China, Mexico. Most explicitly, the piece comments on globalization: the bowls are from all over the world, and yet are nearly indistinguishable. It brings up issues of identity and locality within a globalized economy and forces viewers, perhaps, to wonder how much an “asian” bowl is simply a commodity. More abstractly, through the unfilled bowls, it sets a tension between substance and emptiness. The purpose of the bowls are to contain food, and yet they leave this purpose unfulfilled.